Like many of the events in my life, I have fallen accidently into my latest part time job. Being a teacher, I often find the need to supplement my more than ample income. Previous endeavors include book store clerk, liquor store employee, pizza delivery, and now I am a pirate (200 years too late). It’s the easiest gig I have ever had. I show up to birthday parties, public events, day camps, and such to entertain for about an hour. I do face painting, story-telling, and even have learned how to make balloon swords. To add to my already witty repartee, I am learning a few coin tricks. The thing that has surprised is how much I am getting out of it. I had no idea how much fun I’d have playing pirate for little kids. The best part is that it’s fulfilling a life-long dream playing the part of the sea faring pirate. I’ve always fancied the idea of being a bit of the rogue. Jimmy Buffett sings, “I read dozens of books from heroes and crooks and I’ve learned much from both of their styles.” The bad guy is always more interesting. Which character comes to mind first from Treasure Island? Is it Squire Trelawney or Long John Silver? C’mon, it’s Long John hands down. I think it’s because they get to do what we all secretly dream of which is to rebel against the society. 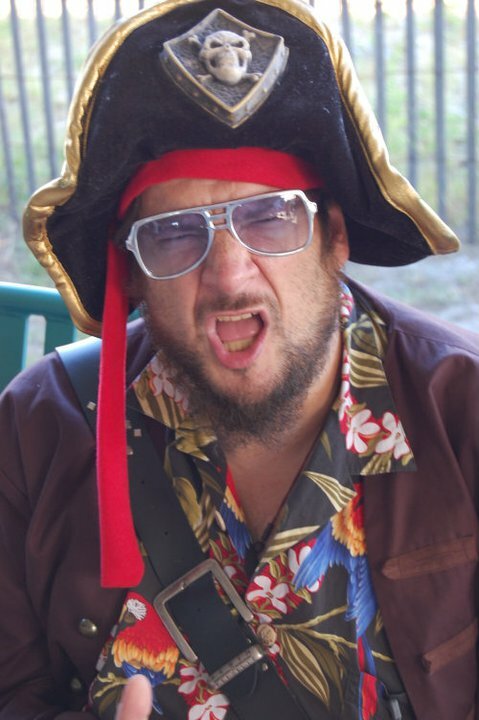 Pirates are the original version of “Damn the Man!” They illustrate a freedom from laws and consequences unless they get caught by the Queen’s Navy and then….CRICKK!!!!!! It’s pure escapism flavored with a bit of high seas adventure. Besides what kid or adult never dreams about the joys of finding buried treasure? Every time I get my college loan bills, I have a very vivid desire in finding Billy Bone’s li’l treasure chest of gold. And the clothes…..I have my own outfit that I wear to become Pineapple Rob and have to admit that I love wearing it. The footwear is a bit uncomfortable and the hat unwieldy, but the jacket makes me feel like a rock star. If it was fashionable, I‘d wear that jacket constantly, much to the delight of my very understanding girlfriend. The whole swashbuckler get-up makes me feel like coolest guy on the planet. Now, I get to pass on my secret life to the next generation. Kim’s little boy, Jude is seven and at that perfect pirate-magic-age. The Pirates of the Caribbean movies were how we first bonded and it’s laid the ground for higher purposes like Indiana Jones and of course, Star Wars. I never realized how much fun I’d have sharing this interest with my sidekick as I’ve come to refer to Jude. I so want some door knobs like these..
On our recent family vacation to St. Augustine, we took in the Pirate Museum. Needless to say a good time was had by all but especially the boy and me. I honestly can’t say who was more thrilled to see all the pirate replicas, weapons, flags, and such. Kim and I had to keep a weather eye on the lad because Jude was running around the interactive exhibits like a squirrel on Red Bull. 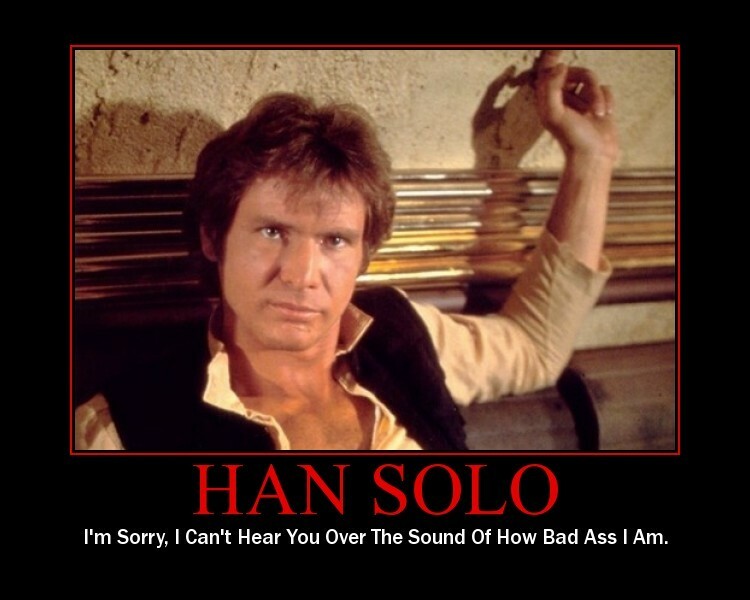 I restrained myself from saying this to Jude. As a result, Kim and I had a lot of great laughs and few awwws watching Jude and his sister, tear through the museum like they were sacking their own Spanish Galleon. 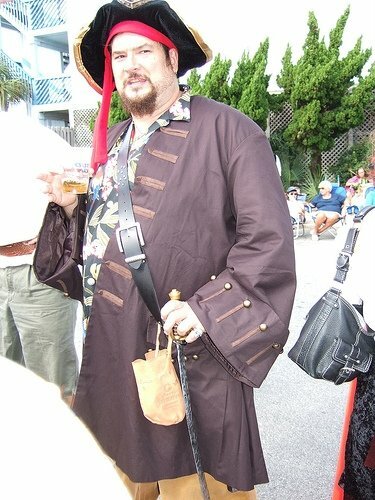 On the sensible level, I realize that Jude probably didn’t really learn all that much about real pirates. On a more relatable level, I get it. It was one big over load of pirate stimulus and a large part of me wishes I could have seen it from his eyes and been transported back to that little boy that wanted to run away and sail around the seven seas looking for adventure. 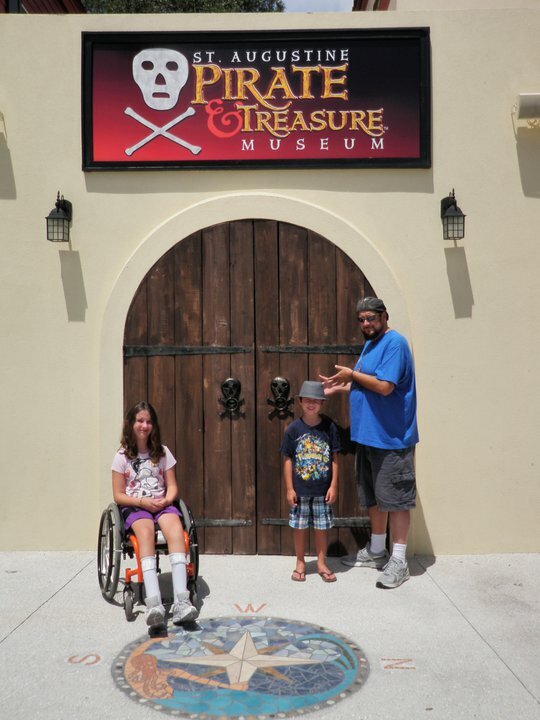 Besides how well should one act when visiting a Pirate Museum? It kind of defeats the purpose…..